While huge amounts of information are available on overseas property prices, rental yields, and foreign legal systems, considerably less thought appears to be given to currency issues. Yet choosing the right currency broker can make a substantial difference to what the buyer is actually paying in sterling terms. High Street banks are many buyers first port of call, but they tend to offer a poor service to buyers. Currency transactions aren’t their bread and butter, when you speak to your bank you’re probably not speaking to a currency specialist who can take you through all the options, when you speak to a broker, you know you’re talking to an expert. Apart from helping clients get a better rate, what currency brokers are about is market expertise. For instance, forward contacts, stops and limit orders can be used to minimise clients’ risk, or to wait until a particular rate can be achieved. That can make a big difference compared to simply buying at spot rates. Banks are also frequently criticized for the time they take to handle currency transactions. In a property purchase where the date of completion is fixed, and where clients are quite likely not to be in the UK at the end of the process, lack of timeliness can even derail the entire deal. Even when the UK bank has got its act together, the receiving bank abroad can take further time to handle the payment, (and importantly, charge for receipt of the funds) . If this sounds like bank-bashing, it’s not intended that way. Banks and currency brokers have completely different business models. Currency brokers go for a high volume of currency transactions and low margins. Banks don’t have the volume, so they have to have high margins. They will have multiple charges such as a handling fee, receiving fee, and so on. A good currency broker will hand-hold throughout the process. That means, for instance, that the broker will report the funds transfer as soon as it happens, and will also ensure the funds have arrived in the recipient bank. Of course the rate clients are getting will be better than the rate they’d get from a High Street bank. 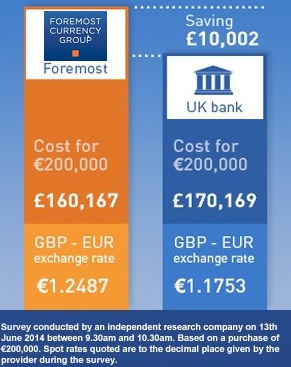 We know that many of our clients can save between 2.5 and 4.5 % against booking currency from the bank. If clients are “unsavvy” and pay tourist rates, the variation could be even higher, 8 or 9 %. Add in the benefit of timing, for instance where rates are fixed ahead, and clients could end up saving between 10 and 12 % on some deals, which on a €400,000 house is a very considerable amount. The difference can be the price of a swimming pool.